What would you think if I told you that today you would become a viral sensation just for dropping a phone? You would have to laugh. It’s a silly thought but something that actually happened. On the 19th of September a simple search for iPhone brought up thousands of results, the number one being the story of a man who dropped the phone as soon as he got hold of it. To top it off he was first in line and it was all captured live on national news. The difference between those articles and this is that they were written by media outlets that didn’t have the full story and as a result wrote down incorrect facts, and even quoted words that were never said, all because they want something that sounds more sensational. This article on the other hand is written by the man that dropped the phone, the man in those articles that knows exactly what happened, and what was said. I am writing this to state what actually happened and to give an insight into what it is like to go “viral”. After arriving home I received a call by Lisa Fernandez, the reporter who interviewed me. She informed me that I was now a viral sensation and that I should expect a big amount of attention. I checked my twitter timeline, and just scrolling through my news feed every third tweet was about me. I follow many sites and media outlets. I was seeing Forbes, Metro and even the BBC reporting on it. This itself sent me into a panic state. I was shaking like crazy, it was scary. You may not be able to comprehend how being all over the media could be a scary thing, but it was. I was receiving tweets to my Twitter account at a rapid rate, my Facebook went into an overload and to top it off I couldn’t use my brand new phone because of how many notifications were coming through it. To make it even scarier I was receiving calls from radio stations and Nine wanted me to come in to their studio that night to go live on TV. Despite me now tweeting people telling them what really happened and even sending out a tweet saying the phone was fine media was still writing incorrect media reports. One of the most common sentences I read was that I had been camping out all night, maybe even for days to get hold of the new device. 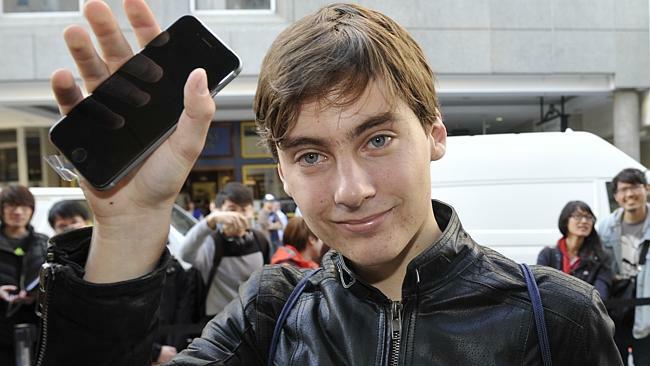 Many sites reported this including Mashable.com who stated, “After lining up all night, Jack Cooksey was the first customer at Perth’s Apple Store”. I wasn’t there overnight; in fact I was there barely over two hours when I came out with the phone. I was only first because I reserved the phone for pickup. This wasn’t the first time a media outlet was to incorrectly report the story, and it wasn’t the last. Another report by the Independent said the phone fell flat on it’s front and shattered. This was because someone claiming to be me tweeted a picture of a broken screen. To this I replied to my whole Twitter feed. Later that day a Nine News reporter came to my house for a quick interview in my living room which was something I could never have imagined happening when I left for the Apple store that morning. I thought this would be as big as it got, but boy was I wrong. Before I went to the Nine studio I received a call by an Irish radio station and even a Russian one. It had gone overseas. Later that night when the US awoke was when it went huge though. The YouTube video, which now has just under 20M views, shot up millions in hours and people like Perez Hilton and Jimmy Fallon were talking about it. I was receiving emails and tweets left, right and centre from American media asking for pictures and interviews. This even included TMZ. Now many months after “the incident” I still receive contact from media, although obviously a lower amount and I still get people asking for pictures of me or taking them without permission in the public. I have also done a few more interviews and been shown on shows like Have you been paying attention, rudetube and the Big fat quiz. If there was something I got out of this is that you can never believe everything the media says. They are in it for a story and they are there to grow their audience. Another thing I gathered from this is that silly stories like this are more popular than world events that have much more serious consequences. I also learnt to ignore what people were saying about you. I was called silly, clumsy, stupid and even comedians insulted me, I ignored this, just like I have ignored all the death threats and calls for me to kill myself on Youtube. These people don’t affect me, they don’t know me, and as such their opinions of me are irrelevant. Becoming viral isn’t all it is cracked up to be, but it sure is a thrill ride.